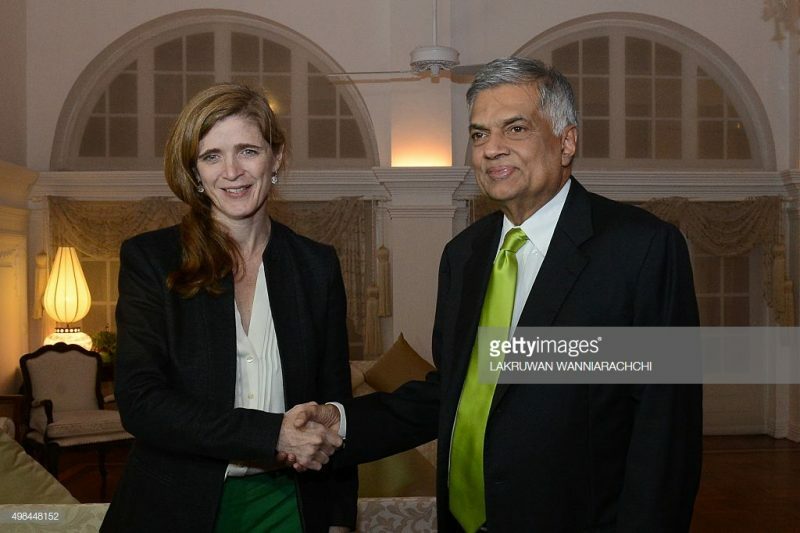 November 10, 2018 (LBO) – Former United States Ambassador to the United Nations and human rights expert Samantha Power has taken an aggressive stance with regards to Sri Lanka’s constitutional crisis. Making several tweets on this issue, Samantha Power has advocated for targeted sanctions on Sri Lanka if constitutional democracy is not upheld. After the democratic win during the mid term US congressional elections, Power’s voice is likely to become increasing more important. In a democratic Presidential administration, Power would likely be a contender for the United States’ highest ranking cabinet position, Secretary of State. After the Democratic control of the US congress is officially cemented in January, the chairmanship of the powerful House Foreign Affairs Committee will be a member of the Democratic Party. The Democrats in the committee had recently released a strong statement on what one termed ‘chaos’ in Sri Lanka. The United States and the EU are Sri Lanka’s largest trading partners and both have released a myriad of statements indicating they are displeased with the recent political turn of events in Sri Lanka. If Sri Lanka’s constitutional democracy is not upheld, it is increasingly likely that the country will suffer significant economic hardship as a result.